My Echinacea Purpura flower heads were just opening and now they have all disappeared completely off the stems at the top. What could have caused this? There's no sign of them on the ground. Deer. While deer are not normally fond of echinacea, they will eat the young flowers, especially if they are hungry. Over population of the deer in many areas have left them starving, even in the height of summer and when they are like this, they will start to eat plants they would not normally eat. 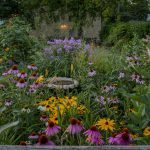 The good news is that echinacea responds to deadheading (which is what the deer has done), and you should see another round of flowers this year.